The New York Times Best Seller now with 30% more zombies! “It is a truth universally acknowledged that a zombie in possession of brains must be in want of more brains.” So begins Pride and Prejudice and Zombies, an expanded version of the beloved Jane Austen novel featuring all-new scenes of bone-crunching zombie mayhem. This deluxe heirloom edition includes a new preface by coauthor Seth Grahame-Smith, thirteen oil painting illustrations by Roberto Parada, and a fascinating afterword by Dr. Allen Grove of Alfred University. Best of all, this limited special edition features an incredible 30 percent more zombies—via even more all-new scenes of carnage, corpse slaying, and cannibalism. Complete with a satin ribbon marker and a leatherette binding designed to endure for generations, this hardcover volume honors a masterpiece of classic zombie literature. 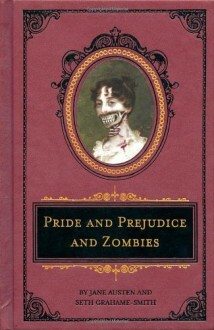 An entertaining read: Jane Austen's witty work made even more fun with the addition of the fight against the increasing zombie population. With laugh-out-loud bits, this is worth a visit. The prequel "Dawn of the Dreadfuls" sets this up nicely.